Carduus marianus originated in Europe and Asia and is now widely spread across the world. It is often referred to as “Milk Thistle” and “Silybum marianus”. 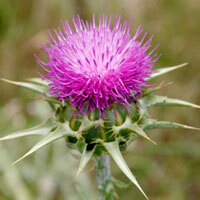 Liver protection and stimulation of detoxification are the most highly regarded benefits of Carduus marianus. Regeneration of damaged Liver tissue and protection against toxins and disease have also made the Carduus marianus one of the worlds most popular herbs.